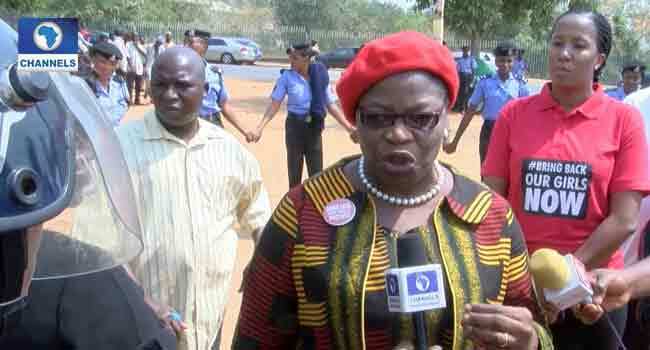 A co-convener of the Bring Back Our Girls (BBOG) group, Oby Ezekwesili, and some concerned individuals have reacted to the return of the Dapchi schoolgirls abducted by Boko Haram terrorists in Yobe State. Most of the girls returned to the community on Wednesday morning, more than four weeks after 110 students were kidnapped from the Government Girls Science Technical College (GGSTC), Dapchi, on February 19. Although the number of girls that returned has not been confirmed, there is heavy security presence in the community while the parents and other residents are jubilating over their return. On her part, Ezekwesili noted that while the BBOG celebrates the return of the Dapchi schoolgirls, the Federal Government should swiftly deploy the winning formula to secure the release of the remaining Chibok girls. There are #112 #ChibokGirls REMINING to be RETURNED. WE DEMAND that you also ASK THEIR ABDUCTORS to RETURN THEM IMMEDIATELY! NOW!! Aaaaaah!! There is SO MUCH JOY that this news is springing up from our HEARTS! Very good that . @AsoRock @NGRPresident have now confirmed the RETURN of OUR #DapchiGirls . WE ARE GLAD. Beyond HAPPY for OUR Girls and their families. Someone just asked me if our Movement . @BBOG_Nigeria will CONTINUE with our LEGAL SUIT against . @AsoRock @NGRPresident @MBuhari for the GROSS NEGLIGENCE that let to #DapChiGirlsAbduction. Our 14 QUESTIONS have BECOME EVEN MORE RELEVANT with their RETURN. Good News! #DapchiGirls are back! The way the #DapchiGirls were kidnapped after the military inexplicably withdrew and the way they were returned by Boko Haram is a classic case of the general Nigerian adage, the more you look, the less you see. So you want our security agents to attack convoy of vehicles with #DapchiGirls after being in the know of their return? Even if you are a novice in securiity stuff, those American movies could have saved you this embarassment. Feeling happy and sad  at the same time #DapchiGirls.